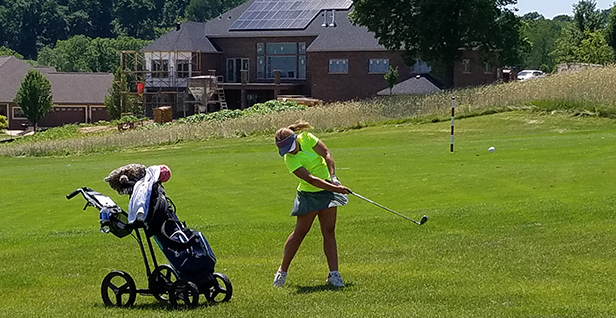 Ashbury, Iowa – Round one of the 43rd Iowa Girls Junior PGA Championship took place Sunday at the Meadows Golf Club. The two-day event will conclude tomorrow with two girls from the 16-18 age division qualifying for the 43rd Girls Junior PGA Championship. Brooke Boardman holds a five-stroke lead in the girls 16-18 age division after round one. Boardman carded a 3-over-par 75 on day one. Sarah Nacos sits in second place after recording an 8-over-par 80 in the first round. Click here for full results. Rylee Heryford carries a one-stroke lead into the final round in the girls 14-15 age division. Heryford carded an 11-over-par 83 in the first round. Erika Holmberg finished round one in second place after recording a 12-over-par 84. Click here for full result. Meghan DeLong sits atop the leaderboard in the girls 13 & Under age division after carding a 5-over-par 41 in nine holes. Lauren Briggs finished round one in second place. Briggs recorded a 12-over-par 48 in her nine hole round today. Click here for full results. The final round of the 43rd Iowa Girls Junior PGA Championship begins tomorrow at 8:30 a.m. at the Meadows Golf Club. Updates will be provided on the iowapgajuniorgolf.com website. Click here for round two pairings.